Mortgage rates are at seven-year highs. At 4.61%, mortgages cost 40% more than they did at the 2012 low of 3.31%. But the cost of a mortgage isn’t that much higher now that it was at the lows: just $80 a month more per $100,000 financed. Mortgage rates tell us more than the cost to finance a home, however. They also tell us about the risk of a bear market in home prices. Right now, they tell us homes are still a low-risk investment opportunity. At least that’s what mortgage lenders believe. Mortgage rates tell us a great deal about risk. Investors get risk-free returns with Treasurys. To draw investors into mortgages, there is a risk premium. The difference between mortgages and 10-year Treasurys is shown in the chart below. 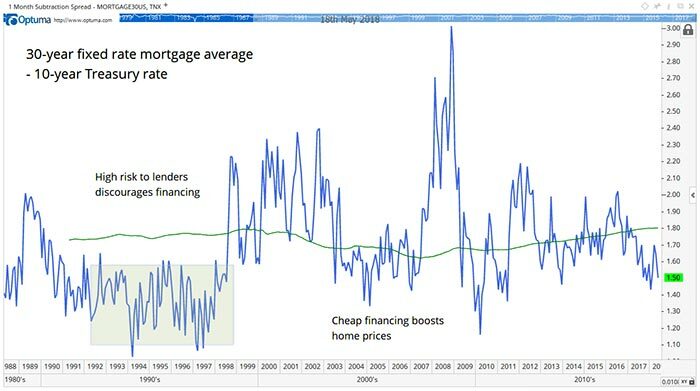 This is the risk premium on mortgages. The green line in the chart is the 20-year average of the risk premium. The blue line is the risk premium, or the excess return lenders receive for mortgages compared to Treasurys. The 10-year Treasury is used because homeowners stay in their home an average of 10 years. This makes the 10-year Treasury the benchmark for the industry. When the risk premium shown above is higher than average, lenders are signaling they believe risk is higher than average. Lower-than-average premiums indicate lower than average risk. Right now, the risk premium is 1.5% and falling. From a lender’s perspective, this means there is little risk in the housing market. They expect defaults to remain low and prices to remain at least steady. With interest rates likely to continue rising, many consumers will believe now is an ideal time to buy. They want to lock in low rates. That’s understandable. And that understandable desire will push home prices up in the short run. If you’re looking to grab a home at a bargain price, that might not be possible. But the smart money behind mortgage lenders tells us homes are a safe investment. With prices likely to rise, now is the right time to buy.